Bimmerfest is an automotive event predominantly dedicated to the SoCal BMW ownership base. Naturally, other cars, from other makes are always welcome, but in true fairness, this is, first and foremost, a BMW event. Held at the Auto Club Speedway in Fontana, California, this is the right place for what some consider the best and biggest BMW party in the country. 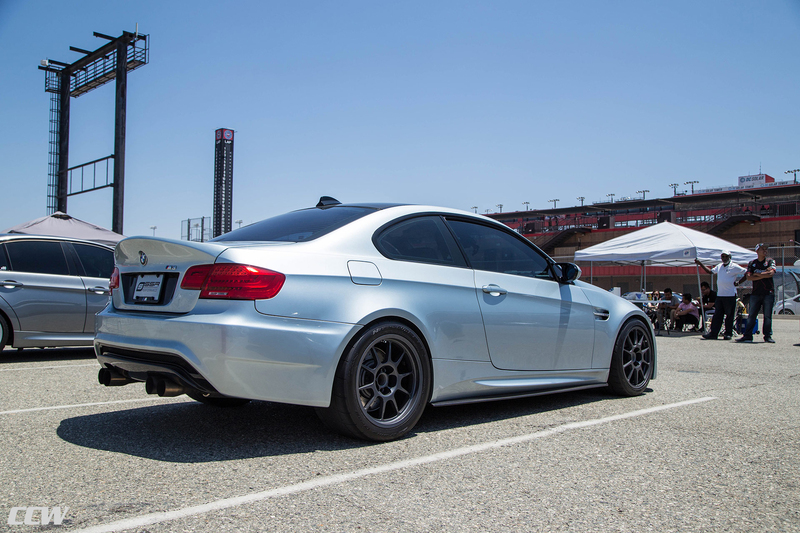 The 2018 Bimmerfest was held from May 26th, 2018 – May 27th, 2018 and CCW Wheels was present in full force. We brought two distinct Alpine White BMW 135i builds, followed by a track-ready Silverstone Metallic II BMW E92 M3 and a track-ready Guards Red Porsche 997 Carrera 2S – all three featuring a set of our custom-made wheels. The Alpine White BMW M135i features what many call a bagged look. Equipped with an air ride system, this small & nimble 1 Series brings the best of both worlds. With a push of a button, you can get your stance to an aggressive level or bring it up to normal, daily driving height in no time. In turn, thanks to this easy to use system and a set of CCW Classic three-piece forged wheels, this 1 Series accomplishes a pretty impressive look. The Silverstone Metallic II BMW E92 M3, on the other hand, is a completely different beast. Built for the track, this M3 features a set of CCW C10 wheels. A CCW Best Seller, the Corsair C10 is designed for road race use and is the wheel of choice for many Pro SCCA and IMSA performance builders. A perfect addition to a track beast like this. Finally, an intruder in the world of BMW’s, a beautiful track-ready Guards Red Porsche 997 with a set of CCW Classic three-piece forged wheels in a Matte Black finish. You can grab a detailed look at the entire CCW Wheels 2018 Bimmerfest gallery right below.